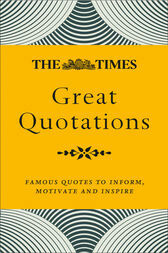 Struggling to recall those elusive quotes and sayings? With this thematic approach, The Times has the answer with a selection of the best one-liners across multiple topics and including a helpful people index to help you find who and what you are looking for. James Owen is an author, historian and journalist who has written regularly for The Times for the last 15 years.